Well, it came out yesterday, but I've been away from Blue Sky Headquarters, so I wasn't able to post it till now. 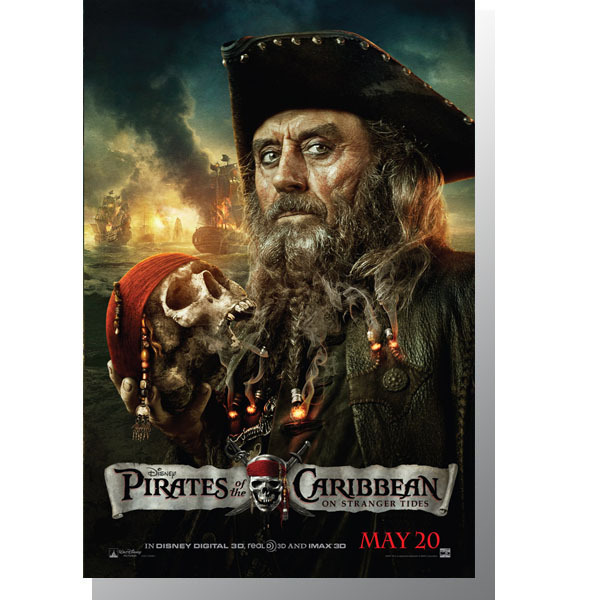 Of course, it doesn't show any action, it's a character sheet for "Pirates of the Caribbean: On Stranger Tides." And although he doesn't look like what I expected, I know that McShane will deliver an amazing performance. I know that his character is based on the real pirate, but it's a story involving more myth than the man. Still, it would be nice to see them incorporate some of the real man's history into this pirate fairy tale. Perhaps if the tone and scope of this film is closer to the original, we can expect the second trilogy to materialize in a less chaotic way. UPDATE: If you'd like to see the collection of all the character one-sheets, then head over to Coming Soon's post here. That skull he is holding has me intrigued, the accessories make it look like the Captain's. "If I didn't kill a guy every now and then, people would forget who I am." That skull kind of references that little quote, don't you think?